I scooped a dollop of the thick Createx onto a recycled palette, and using a small all-purpose housepainting brush, swiftly painted the first circle … in quick succession I added all the others. I loved the almost-metallic turquoise of the paint, and the loose, quick application of the paint made for some energetic circles … but what about those squares? I started on the other sofa and was pleased to see that loosely painting the squares produced the same energy as the circles, if with more corners. Circle and square base-coats complete, I moved on to phase two: defining the circles further — and breaking up the base color — with a lighter version. I mixed some titanium white into the turquoise to produce a somewhat paler shade and, using the same brush, selectively traced the circles. Looked good but I wanted more definition. So, I added more titanium white for an even paler version and added still more circles using a smaller art brush. I liked … but now I wanted something to break up the blues, so using two yellows, and an orange shade, I added strategic accent circles. Done! Moving to the other sofa, and following the same steps, I soon was finished with that one, too. 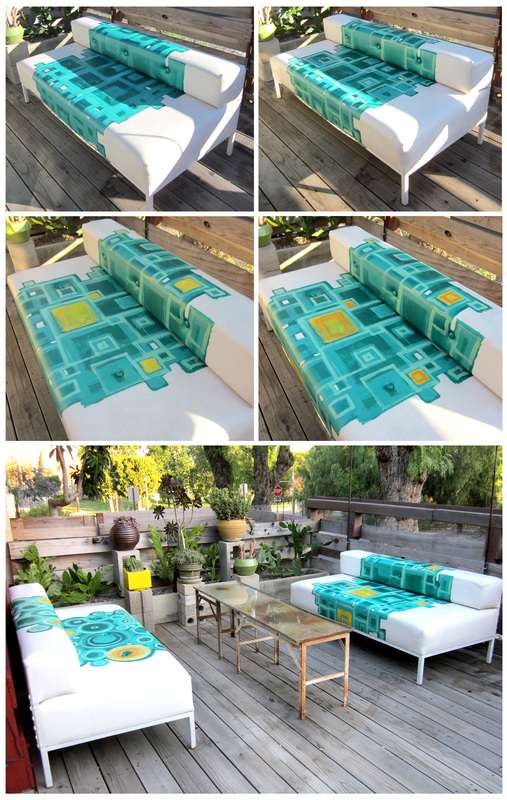 The circle sofa pattern had real movement and the design reminded me of audio speakers … conversely, the square sofa had a more geometric energy that made me think of a crazy quilt or maybe an afghan knitted by an ADHD-afflicted granny. I really liked the addition of blue into the Rancho color scheme and the deck now looked really festive, perfect for both the coming garden tour and a later spring garden party! Project cost: Zip … Thanks, Terry! WOW…are you serious? You just whipped that out? I would have got the first bit of paint on there and been totally sure I had just ruined them both. Your artistic talents shine through again. Ha! Oh, I had that “oh, pooh, I just ruined ’em!” moment… but over time I’ve learned to ignore it, take a deep breath and keep going … I love ’em! 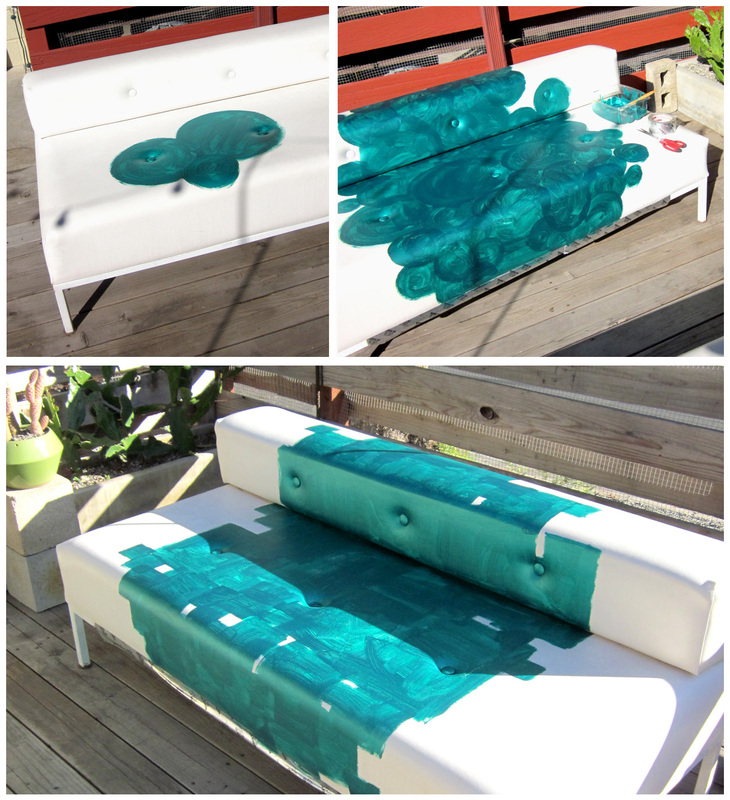 Wonderful~ I would have been afraid to ruin the sofas with some random mess. You did a fantastic job and it is Random in a stylizied mannerthat shows how talented you are! I loooove what you did! 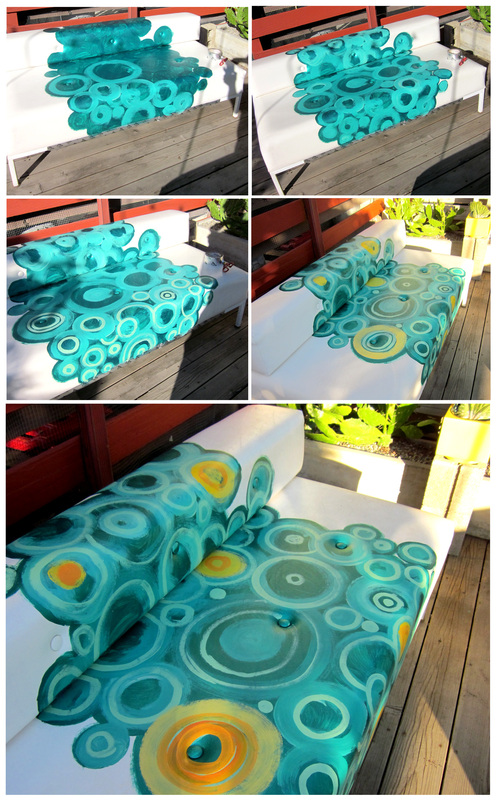 The chairs were cool without the paint… but now they’re awesome! Ditto, I love what you did. I am in awe, absolute AWE!!! First, that you were able to find such cool sofas. Second, that you’ve created unique, only you have them, furniture for your garden. You are brilliant and I love your garden! Thanks, Lauren … I appreciate your comment … Your blog and website look very interesting, as well! PS and I love how you showed us the process. Showing how simple the process is is helpful, I think! Beautiful transformation! You’re garden is looking super hot!!!! Late some night, when you find me attempting to steal these and stuff them into the back of a rented Ford Focus with San Francisco license plates, you will mix up some cocktails, get comfortable and laugh. I will ignore you. BECAUSE I WILL SUCCEED. Oh yes. Haha… great story, the cocktail element totally added realism! those are worth a loud gasp! you outdid yourself this time. i have nothing to add but sheer admiration! I love it I love it!!!! Can’t wait to see ur garden. U r a true inspiration! Thanks, Sheeba … but what does Coco think? Thank you very much, Delphine! You did a great job. I love that teal color! I wasn’t entirely sure at first… but I love it too, now. You are ferociously talented and fearless. I must be an ADHD-afflicted granny because the couch with the squares is my favorite, but the two together are inseparable. I hope you signed those couches! How did you do this?!! Vinyl? What type of createx paint did you use? Anyways, please let me know. I really wanted to do this. Did the paint hold up on the sofas well? let me know! Wary Meyers does this kinda stuff. You would probably like their ideas. Look them up. they have a new book out too that i’m waiting to get. Hi, Nicole, thanks for your comment. To answer your question: “How did you do this?”, please re-read the post; but essentially I loaded my brush and just did it. To find out what Createx paint I used, go back to the post and click the words Createx paint in the first paragraph. It’s a link to the Createx website. The paint has held up extremely well, especially since they stay outside at all times, have been rained on, I hose them down when they get dirty and I have two manic chihuahuas that’re all over them. There has been no cracking or peeling at all. I love the Wary Meyer’s book ‘Tossed and Found’ and will be doing a project from that book here soon… Watch for it! I saw this on Apartment Therapy and I think you did a fantastic job! I had a love seat featured there once and the comments were not so nice, but it was awesome. Anyway, very creative! Thanks, Kelli … my garden’s been featured there in that area and the reviews were much better! This is FREAKING AMAZING!! I love, love, love the design and color choices! You totally completed those sofas!! Fabulous! 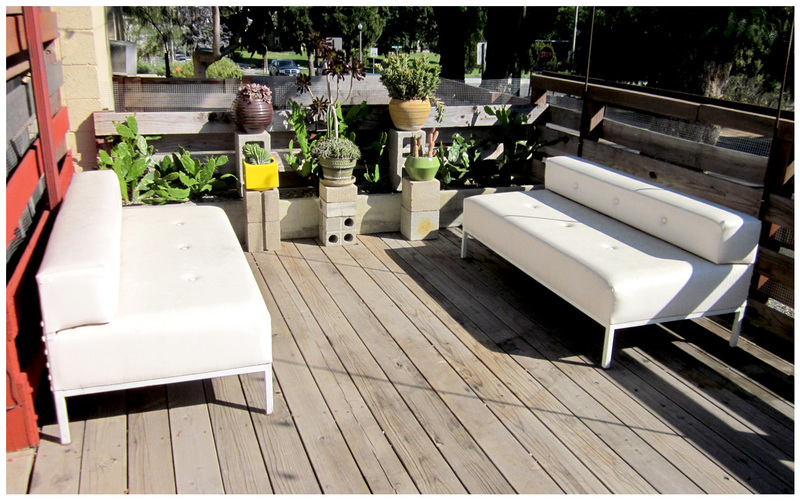 I loved the white, but the paint really makes the sofas pop! How has the paint held up after a year!!?? Yes, they have gone to a good home with owners that absolutely adore them. Fortunately, they didn’t move too far away, so you can always come over and visit them. Of course, a glass of wine or a nice cold beer will be served during the visit. I can’t wait for you to come see how they look in person. Hi, Melissa, thanks for your question. If you’re asking whether I finished the painted areas with a kind of sealer, the answer’s no. I used Createx paint (with other regular acrylic paint added for color) only. I visited the couches recently at their new home and they still look fine. My only caution would be NOT to apply the paint super-thickly, that could cause something to catch on it and make it peel up. Hope this helps! 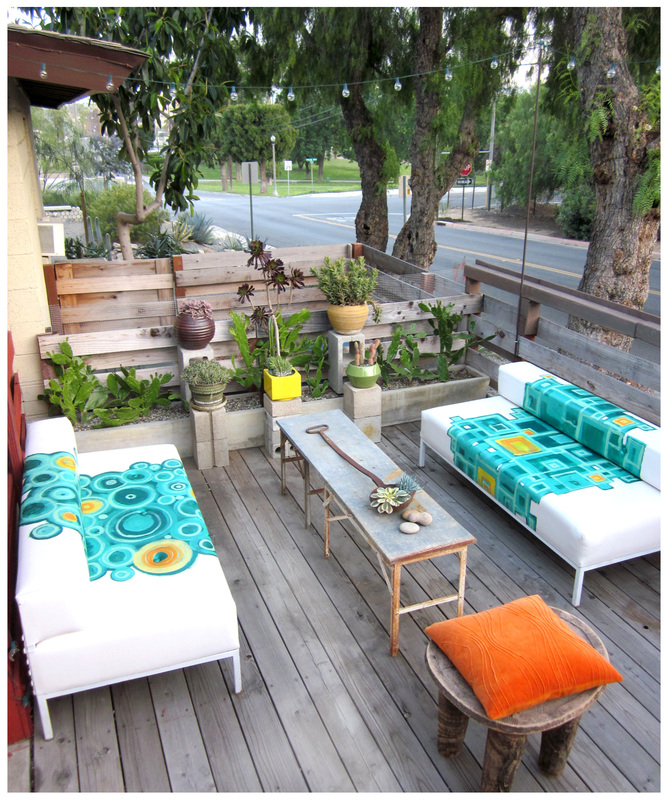 Easy Ways To Spruce Up Your Outdoor Space For Entertaining!